I first met Ivan Zuccon at Cannes in 2000 through one of those utterly meaningless but ultimately beneficial chains of events. I was at a bar one evening when I got talking to someone (no idea who - sorry!) who asked if I wanted to meet Tiffany Shepis. Tiffany was then the hottest starlet on the block, having appeared in Tromeo and Juliet and the Spanish artflick Shampoo Horns as well as hosting some Troma stuff for TV. Plus she is way cute, so I agreed to meet this bloke at a time and place the next day and he would introduce me to Tiffany Shepis. And indeed he did. Tiffany was at Cannes in her capacity as a producer/distributor, having set up a company called Prescription Films - and it turned out that her business partner was none other than Jennifer Kennedy, whom I had first met back at the 1998 AFM when she was working for Troma. So that was all very nice. It was great to catch up with Jennifer, and to meet Tiffany, but the important thing (in retrospect) is that in the Prescription Films office at that time was a young Italian chap named Ivan Zuccon who was showing Tiffany and Jennifer his first feature, L’Altrove aka The Beyond. We swapped cards and stayed in touch and he sent me a copy of the film - and it just blew me away. 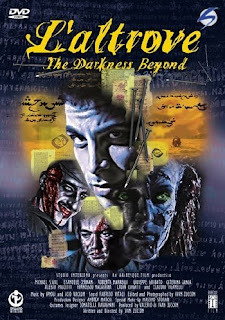 L’Altrove - which was swiftly retitled The Darkness Beyond in its subtitled version, to avoid confusion with Fulci’s The Beyond/L’Aldila - is simply one of the best Lovecraft movies ever made. Though merely ‘inspired by the visionary genius of HP Lovecraft’ rather than adapted from any specific story, it perfectly captures the nightmarish horror of HPL’s work. A prologue in Baghdad in 1571 sees the philosopher Al-Caleb translating the Necronomicon for Dr John Dee - until something unseen attacks him and drags his limp body away like a child’s doll. Flash forward 500 years to Arkham, where a radio informs us that there is massive civil unrest by ‘violent and insane’ sections of the community and that some of the army units called in have mysteriously vanished. Roberta Marrelli plays Elena, a student of the occult who has somehow come by Al-Caleb’s blood-spattered fragments of translation. She performs a rite, puts on a mask - and plunges herself and us into a world of nightmare. Running through the empty countryside, she comes across a lone soldier - Private Randolph Carter(!) played by Emanuele Cerman - in a ruined building. Behind him is a low tunnel into which the rest of his six-man patrol have vanished and in his satchel is the book which they found earlier: Dee’s original Necronomicon. Later that night, Elena is lured into the tunnel by mysterious voices and when Carter follows her, he sees her brutally killed by a mysterious figure in a white coat. Running for his life, the soldier passes over ‘the threshold’ into ‘the beyond’ where the rest of his squad are trapped, hunted by one of their number, Warren (Giuseppe Gobatto, who also played Al-Caleb in the prologue), who entered the tunnel first and now believes the ancient, unnamed ‘Old Ones’ to be God. The plot then becomes a surreal nightmare, with the Old Ones seeking the return of the book. 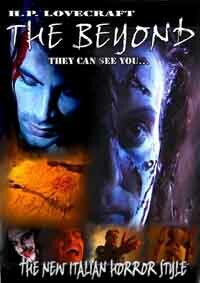 The CO, Lieutenant Michael Salgari (Michael Segal), suffers through terrifying hallucinations, including his former lover Sonia (Laura Coratti), and a teenage girl (Catarina Zanca) who claims to be the unborn baby that Sonia was carrying when she died 15 years ago. Throughout it all, the white-coated figure and the insane Warren stalk their prey. How much is real? How much a dream? No way to tell. What there is, however, is vast quantities of blood - from bullet wounds, from rough surgery, from hideous torture - and some truly terrifying imagery. 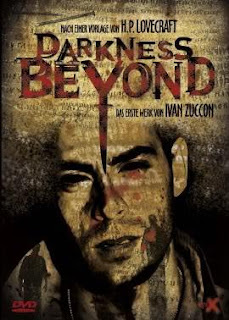 By any standards, The Darkness Beyond is an astounding debut from a major new name in horror cinema - as evidenced by Ivan Zuccon’s subsequent features Unknown Beyond and The Shunned House. Shot on digital video by Ivan himself, the cinematography is beautiful - coloured lights, swirling smoke, scenes lit by electric or flaming torches - and the editing (also by the director) is stunning. It is very easy, when a film is designed to be dreamlike, to be self-indulgent or to just throw random images together, but every jump-cut, every twisted angle, every cut-away is just right here. But Ivan is not a one-man band and there is some sterling work here by others, not least the excellent cast. Cerman and Segal, who are also in both of Ivan’s other films, carry their roles superbly, and Marrelli (also in Unknown Beyond) is amazing in her depiction of genuine, uncomprehending fear. One of the ways in which the film constantly trips up the viewer is in the passing of the central role from one character to another - just as we think we know who the ‘star’ is, they’re killed. Though that doesn’t necessarily preclude them from still being in the film! An epilogue sequence, set far in the future, is reminiscent of the opening scenes in Richard Stanley’s Dust Devil. Massimo Storari (who appears briefly as a monk) contributes some superb make-up, tearing the soldiers’ flesh and splattering them with blood. Mention must also be made of sound editor Fabrizio Vitali’s contribution. Because so little is seen - there’s neither tooth nor tentacle spotted of the old ones themselves, as it should be - the sound effects are vital and help to create a truly frightening atmosphere. Ultimately Prescription did not pick up L’Altrove, but I was able to get both this film and its sequel screened to general acclaim at the Festival of Fantastic Films the following year. Gradually the word on Ivan Zuccon’s work has spread and I am absolutely delighted to see his films now getting the distribution that they deserve. The Italian horror tradition is alive and well in the capable hands of Ivan Zuccon.